Hello, first, escuse me for my poor english. 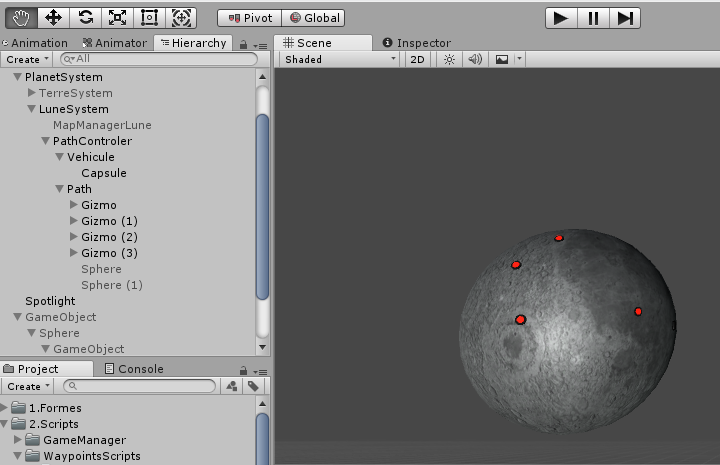 I'm a beginner for 6 months on unity, and I'm trying to build a waypoint system for a spherical board game seems like a planet-shaped map. So, a vehicle moves along a path by choosing the nodes having the lowest costs to arrive at a destination of my choice. everything works great, until I try to have a curve between each node crossed by my vehicle. Of course, the curves must follow closely to the shape of the planet, and having searched for 3 weeks, it is in total despair that I come to ask for a solution. I chose to create my pathinding, so that the next node is added to the vehicle's destination when it collides with the collider of a node until it finishes the path. Everything happens on a sphere that can sometimes roll on itself or that the player can drag on an axis with a mouse. I give you the different scripts, the waypointScript is placed on a node, the pathScript on a empty regrouping the nodes, the objectToPathScript on the vehicle, the pathController in a empty containing the path and the vehicle. Everything is placed in a sphere representing the planet where we travel, itself in a empty with a controller to manipulate the planets system. the third one is the ObjectToPathScript It's here that my problem arises, I think. there are 2 more spheres in the path that belong to my test version. Enable them as well as the vehicle test script, if you want to try the test version.